The ticks are already out and hungry. You're likely finding at least one during your post walk inspection on your 4-legged friend. Besides being a nuisance, many ticks carry disease putting your pet at risk of getting sick. Lyme Disease and Anaplasmosis are the most common tick-borne diseases seen in New England but there are many types of disease ticks can carry. 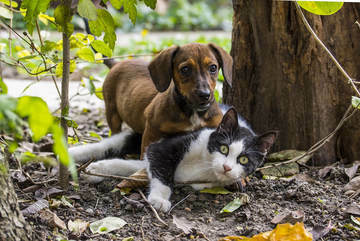 Though a tick bite doesn't guarantee your pet will get sick, being aware of the signs will help you catch it early if they do. The sooner treatment can begin, the sooner your fury friend will feel better. What can you do if your pet has Lyme Disease? Here at MASH, we have had great success treating Lyme using alternative therapies. We leverage a combination of Ultraviolet Blood Therapy (UVBI), Ozone therapy, and Chinese Herbs to help your pet fight back and get healthy. The UV light kills most viruses and bacteria and stimulates healthy cells while ozone creates an oxygen rich environment that helps to reduce the inflammation associated with the disease.